Callback to limit basic block size. This basic block callback limits the number of instructions in a basic block. 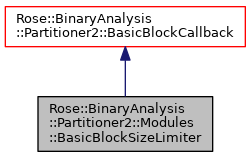 During basic block discovery when instructions are repeatedly appended to a block, if the number of instructions reaches the limit then the block is forced to terminate. This is useful when instruction semantics are enabled since large basic blocks can slow down the semantic analysis. Definition at line 205 of file Modules.h. Shared-ownership pointer to a BasicBlockSizeLimiter. Property: Maximum size of block. A value of zero means no maximum, effectively disabling this callback without removing it from the callback list. Definition at line 226 of file Modules.h. Definition at line 227 of file Modules.h.